Say it with me: bacon-wrapped scallops. Well. This week just flew by, didn’t it? However, my labor for love hasn’t been all we’ve been up to this week. Jamey started bootcamp (not the army-kind, but the extreme workout version), we cooked duck confit in the sous vide (which you know we will blog the next go-round when I’m camera ready), my car broke down, was towed then brought back to life, and I had a race cancelled last night due to bad weather and street floods (plus some pretty crazy hail, which I have never seen in this town). But really, it wasn’t a bad week despite the last bits. We even built up a little backlog of recipes to share! 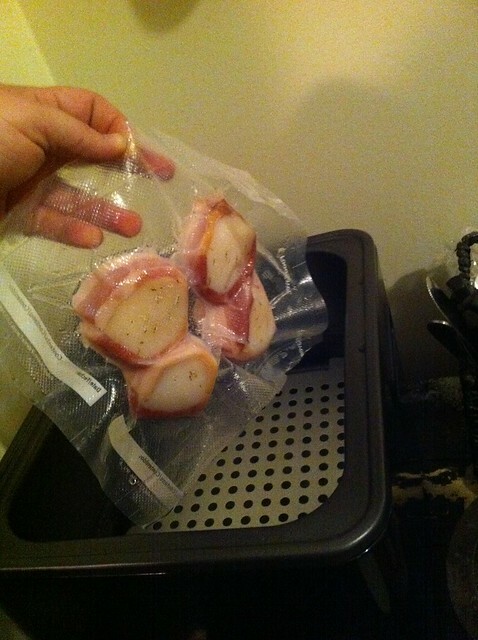 One of these recent experiments was bacon wrapped sous vide scallops, which we pulled together a couple weeks ago. Should I say that again slowly? Bacon. Wrapped. Scallops. Drool with me, if you will. 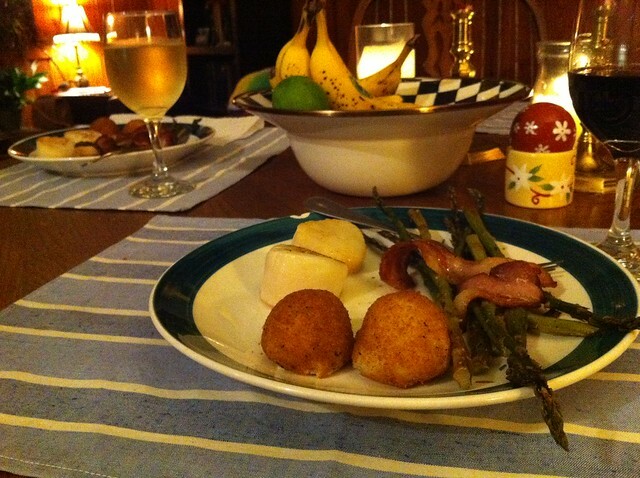 Scallops, bacon, arancini. Oh, my. Our sous vide escapades have so far only been in the poultry and pork lands, so we figured it was time to throw in a little shellfish. Scallops seemed like the easy way to go and a good starter to fish and shellfish, sous vide style. Even uncooked, applewood smoked bacon still looks delicious. 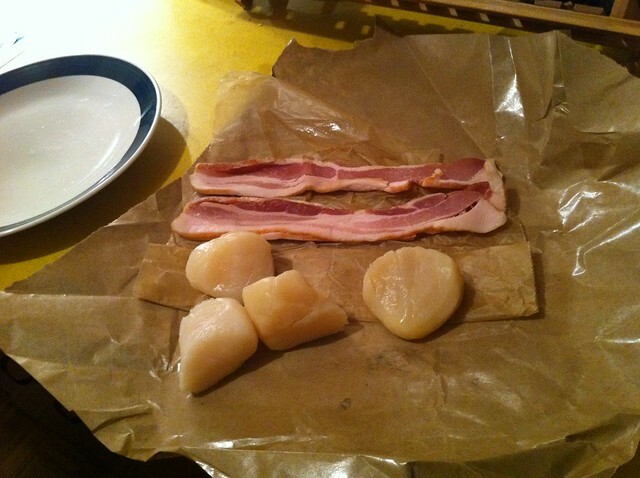 We hit up Whole Foods for our supplies: applewood smoked bacon and big diver scallops. 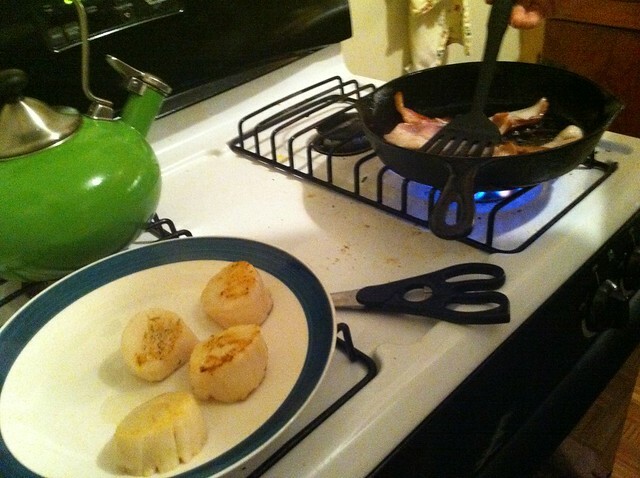 Before wrapping the scallops in bacon, Jamey drizzled them with a little olive oil and added a tiny bit of thyme. Only a little bit, though, because “aromatics can get crazy strong in the sous vide,” says the chef. Into the sous vide they go. Bacon in the skillet. This is a good thing. I had earlier thrown some asparagus into the oven to roast, drizzled in olive oil, Italian seasoning, pepper and salt. We then served the bacon on the asparagus as the meal’s side. Happy Easter weekend, everyone. Get excited for next week, when we cover our Easter egg escapades via the sous vide supreme! Love it! Looks great. 🙂 Another thing I discovered – use the bacon/scallop juices left in the bag and use them to saute vegetables. I sauteed some oyster mushrooms with the jus and they tasted absolutely divine! Thanks for your idea, Jen! Way to put the juice to use. That sounds just delicious…we’re definitely going to have to try that next go-round. Double OH MY! Where did you get the arancini?